The Bird Sanctuary and Wildlife Reserve at Khao Sam Roi Yot National Park is a small coastal zone located at the narrowest part of the Thai peninsula overlooking the Gulf of Thailand. The park is a region of many contrasts encompassing sea, sand, mountain peaks, limestone caves and a forested interior. But perhaps even more significant is its mud flats and freshwater marshlands which provide a superlative breeding ground for a multitude of birds. Migratory birds fly in from as far as Siberia and China as well as Australia and the island of Sumatra. Though bird watching at Thung Khao Sam Roi Yot swamp is a major draw here, there are numerous other attractions to suit the most ardent adventurer right down to the more inquisitive visitor. You may wish to embark on an extensive walk along one of the nature trails or coastal trails, visit one of the limestone caves, relax on one of the secluded beaches or simply charter a boat for a trip to the mangrove-fringed canals. The activities are limitless. 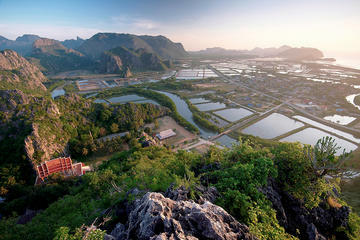 Khao Sam Roi Yot attributes its name to the mountain of three hundred peaks and is best known for its distinctive limestone pinnacles that rise vertically from the marshland and forested interior to a height of 650 metres (2,150 feet). The park is located just 63 kilometres (37 miles) from the popular coastal resort town of Hua Hin and covers an area of 98 square kilometres or 38 square miles. You may have arrived at this page by typing in the keywords for bird sanctuary or perhaps you naturally discovered the articles of Thailand's National Parks covered on my website. Nonetheless, I'd like to wish you a warm welcome. You will surely enjoy the wonderful sights and sounds of this particular park as well as others should you someday decide to visit any of them as I have. For this reason I'd like to introduce you to not only for the bird watching prospects, but also the other attractions Khao Sam Roi Yot has to offer. However, if you are coming to the park specifically for see and photograph birds, the best time would be between the months of August and April as this is the time when the birds come here to rest, feed and breed. I myself am not a bird person per-say, but I do admire the beauty of these flying wonders of nature. Surprisingly the most visited attractions at Khao Sam Roi Yot are the caves once used to shelter bandits who robbed unwary travellers journeying along the coast. These haunts have long been cleared out, but this form of debauchery still exists today in other parts of the world, particularly around the northeast coast of Africa. These predators are known as pirates, but their intentions are the same. However, the caves here are quite safe apart from monkeys who are the only real bandits in the park. There are signs warning visitors to be vigilant. Hidden high up on a cliff-side above the sandy bay of Hat Laem Sala is a cave system called Tham Phraya Nakhon that houses a grand pavilion built for King Rama V in 1896. The cave is located on a headland, and though inaccessible by road, it's best reached via a 10-minute boat ride from Ban Bang Pu fishing village. It is a 6-kilometre (4-mile) trip from the park's northern checkpoint. Sam Roi Yod National Park, also known as 300 Peaks, is one of Thailand's most captivating national parks. It's here where local fishermen still preserve generations-old traditions. This natural region offers plenty of relaxation and hiking possibilities for all ages. All the more reason you just might like to take a guided tour with this 5-Hour tour from Hua Hin or Cha-Am. On this tour, you'll get to visit the Tham Phraya Nakhon Cave. Transportation and lunch is provided. Please see all the details in the link above. It is, however, possible to walk over the headland behind Bang Pu Temple to Hat Laem Sala. There is a five hundred metre (signposted) long trail leading to the cave, but be aware that it is rather steep and can be quite tiring so you would need to be fairly fit to do the climb. And don't forget to wear your best hiking shoes. There is another shaded trail that runs up the hillside to the caves which will take you a good thirty minutes. Most visitors opt to take the boat ride which is fixed at 200 Baht for a complete round trip. The immense twin caves of Tham Phraya Nakhon are filled with stalactites and stalagmites and surrounded by endless climbing plants and tall twitted trees. But more than this, the most dramatic feature is the partially collapsed roof, allowing sunlight to stream in and illuminate the interior and beam down on the famous pavilion known as Phra Thi Nang Khua Kharunhad. If you love hiking, then perhaps you'll enjoy the three hour trek south from Tham Phraya Nakhon to Tham Sai, a dark and dank limestone cave complete with stalactites, stalagmites and fossilized falls. The trail to the cave offers shaded forested areas as well as some fine coastal views. From the coastal village of Ban Khung Thanot there is, however, a shorter trail of around twenty minutes. Ban Khung Thanot is about 8 kilometres (5 miles) from the Ban Bang Pu turnoff. Another great activity at the bird sanctuary and wildlife reserve here is to charter a boat from the park's headquarters at the southern end of the reserve then take a trip along the mangrove-fringed Khao Daeng Canal. Alternatively, you can hire a kayak for a lovely leisurely trip around the coastline. You can also take a half hour trail trek from the park's headquarters and summit the 322 metre Khao Daeng Outcrop for a good view over the Gulf of Thailand. There are two other trails in the near vicinity. One is the Horseshoe Trail, which will take you into the forested habitat of monkeys, squirrels, songbirds and who knows what else. Another is the Mangrove Trail, which leads you through the swampy domiciles of monitor lizards, egrets and the crab-eating macaques. Khao Lak stretches across several scenic strips of sandy upper Andaman coastline. The region is particularly famous for its spectacular scenery of steep rain-forested ridges that extend down to the winding coast. An elephant trek to one of the waterfalls is a must. Khao Phra Taew National Park is located on Phuket Island in southern Thailand. It is the island's last main outpost and primary evergreen rain forest. Within the national park there are several waterfalls and it's also a home to the Gibbon Rehabilitation Center. Doi Inthanon encompasses the highest mountain peaks in Thailand and has several types of fauna and flora, waterfalls and animals such as leopard, Pangolin and flying squirrels. There are also several bird species such as hawk, eagle and Eurasian woodcock. Ko Tarutao is an archipelago near the islands of Langkawi in the Andaman Sea. Its diving sites considered to be among the best in the world. There's a rich concentration of tropical fish and sightings of whales as well as dugongs and dolphins are a common sight. Ang Thong is a group of islands in the Gulf of Thailand, west of Ko Samui. The region is popular for its beaches, limestone caves and abundant wildlife. Canoeing and snorkeling among the coral reef is a major attraction.